There is one question to ask yourself when deciding whether or not you’ll like Far Cry 3: Blood Dragon; do you like the eighties? If the answer is yes, then Blood Dragon may be a game for you. From the opening 8 bit cut scene, to the synth-y soundtrack through out the game this game is a love letter the eighties. Other little details such as the scan lines on the screen (which are not as annoying as you would think) and the casting of Michael Biehn as main character Sergeant Rex Power Colt, are the reasons this game just oozes the eighties. That’s not to say that the game goes so far to become a complete parody of them; the game isn’t as silly as games such as the Saints Row series. Blood Dragon manages to create this alternate 2007 without being too ‘silly’, nearly everything in it seems to contribute to this world and not seem out of place. That’s not to say it doesn’t have movie references and the like, but when it does it fits in with the world the game has created. For example; instead of referencing Predator through something simple like a quote, it instead uses the music from the awesome helicopter scene instead (Little Richard – Long Tall Sally). Another example is the way Rex holsters his gun in the same way as in Robocop, one of a few Robocop mentions in the game. These little winks and nudges to movies fans like myself are awesome and often hilarious but they never take you out of the game, they feel like something that would exist in this world of Cyber-Commandos and Blood Dragons. Other cool Easter eggs and references include the sewer-dwelling, pizza eating turtles who feature in a side quest, Rex singing The Touch (by Stan Bush, seen in the Transformers animated movie) to himself and villain Cononel Sloan wearing a chain-mail wife beater in the vein of Bennet from Commando. If you have played Far Cry 3, there really isn’t much new to say about the gameplay in Blood Dragon. The gun-play is just as solid and satisfying as it was in Far Cry 3, but with the difference being that every weapon is now futuristic. While a lot of aspects of Far Cry 3 were simply re-skinned for Blood Dragon, there are also a few of new weapons in it such as the cool Robocop-esque pistol and the Rifle that fires lasers. But even the re-skinned weapons, such as the bow and flame-thrower, feel more awesome when the enemies being killed are oozing a neon blue blood, the cyber panthers and demon goats are launching themselves at you and the blood dragons are chasing you. That brings me onto a new addition; Blood Dragons, and along with them; a completely new way of approaching and disabling garrisons. You see, Blood Dragons are attracted to the cyber-hearts which you rip from the chest of your fallen enemies, and if you chuck a couple of them suckers into a garrison of enemies mayhem will ensue. Its much more fun clearing out a garrison of enemies if you are simultaneously fighting cyber soldiers while also dodging lasers that a blood dragon has just fired from its eyes. Yep. Blood dragons can fire lasers from their eyes. That line alone should have sold you on the game, but I’ll go on anyway. The game is pretty short, with the actual campaign missions clocking in at around 4 -5 hours. These missions are short on plot but big on action. The levels are often broken up with driving sections, sections where Rex holds out against a group of enemies and other interesting things such as hang gliding and setting fire to blood dragon eggs. The levels never get repetitive and are always awesome, but arguably the main draw to the game would be the open world fun that can be had. Whether this is collecting VHS’s and various other collectibles to get new attachments for your weapons, or raiding enemy outposts there is tons of fun to be had. The idea of playing out what is basically an eighties action movie is extremely appealing, especially to someone like myself who grew up on and still adores eighties movies such as the Rambo films, Commando, Predetor, Robocop and sooooo many more. 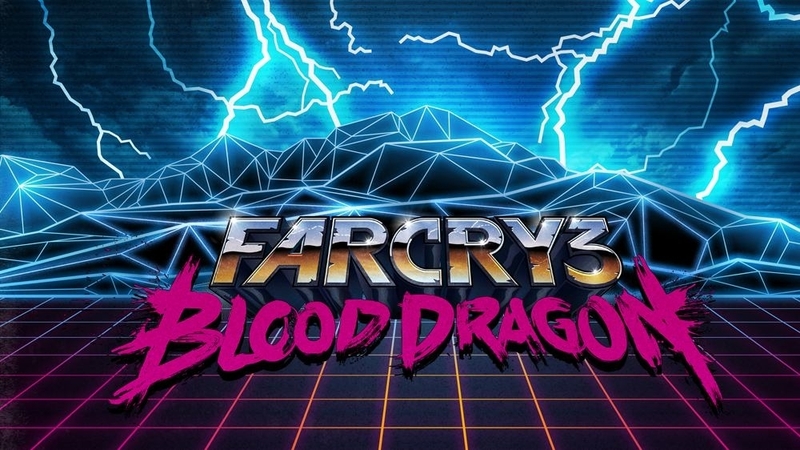 That’s really the key to liking Blood Dragon, if you lived through the eighties, or are like me and wished that you did, you’ll probably love this game. The game play is just a re-skin of Far Cry 3 but don’t let that put you off. Blood Dragon was a huge leap of faith on Ubisoft’s part. Fortunately it pays off, Blood Dragon is an insane blast form the past, and is like no other game out today. Buy it now, and who knows, we might even get a sequel. The Bottom Line: Blood Dragon is a contradiction a re-skin of Far Cry 3 but also incredibly original at times and one of the most fun games of the year. Buy it now, especially if you love the eighties. Buy it anyway, if only to get Michael Biehn to do more voice acting. Great game either way but the quests are very repetitive as they vary from rescuing a hostage or hunting an animal of some sort but it is still a joy to play. Perhaps I enjoyed the game more than you but I found the game rarely got repetitive. Maybe it was my strong love of 80’s action movies and Michael Biehn but I found the game (the campaign missions especially) to be very original. Also, what did you expect from a £11 game? The game was less repetitive and more original than many full price, £40 games.